Looking back on her childhood, Elizabeth Lewis-Crudgington recalls growing up in a home of “love and laughter,” where she and her four siblings (two elder sisters; one younger sister and brother) never saw their parents argue—“not even once.” Instead, Elizabeth (Liz) remembers each morning starting out with a toast between her parents, Arnold and Sheila Lewis. Liz describes life for the Lewis family, which started out in India, as privileged. Her father was an engineer with Indian Railways. Working for the government, he and his family enjoyed the benefits of living in “sprawling 15-bedroom houses built during the time of British rule in India, complete with fireplaces and a team of housekeepers,” she says. But they never took it for granted. And they never forgot to give back to those less fortunate. The Lewis’ also invited hundreds of railway workers to their home every Christmas. They decorated the estate with lavish ornaments, hired a band and prepared “lots and lots and lots of sweets” for every guest, and Sheila stayed up late into the night sewing scarves and handkerchiefs—homemade gifts for each one of the workers. “I saw altruism at its very best in my own home growing up,” says Liz. That strong foundation of love, compassion, hospitality and generosity is something she has carried into her adult life. As Executive Director of Vancouver, B.C.’s Quest Food Exchange since 2008, she helps provide people with the sustenance they need. Quest forms a bridge between local wholesalers, supermarkets and farmers, and social service agencies whose clients need access to nutritious food. Through their not-for-profit grocery stores, and by delivering raw food materials directly to agencies for their own meal programs, Quest helps feed approximately 29,000 people a month. But it’s about more than just food. Liz believes in empowering people with choices so they can go further in life and strive to meet their potential. Quest’s core values revolve around dignity, community and sustainability—values that go to the heart of her upbringing; values she continues to live by every day. In addition to love and laughter, Liz’s childhood featured plenty of outdoor play and indoor reading. (Enid Blyton was a favourite, then James Hadley Chase, John Grisham… “We loved adventure.”) There was also music. Her mother taught piano, and the notes of the keystrokes always rung out through every home the family lived in. And there were many homes. “My dad always believed that travel was the best education,” says Liz. As a girl, she and her family visited nearly 30 different cities around India. When Liz and her siblings finished their education in India, and travel restrictions became a hindrance, Arnold moved the family to Kuwait in 1976 so they could see more of the world. In Kuwait, she settled into her new life. She worked in administration at the Kuwait Institute for Scientific Research (KISR), got married in 1977, and had two daughters, Melanie (now 36) and Marella (now 28). The family stayed in Kuwait until the 1990 invasion. They were on holiday at the time; it was on the morning they were scheduled to return home that they learned that Kuwait had been invaded. Fortunately they had already started the process of immigrating to Canada, after Liz visited one of her sisters in Vancouver’s North Shore and fell in love with the area. So, in 1991, with only their vacation suitcases and the balance of their holiday funds, she and her clan embarked on what she calls the “third adventurous phase” of her life: After experiencing two very different cultures, in India and Kuwait, she moved to North America, becoming a Canadian citizen in 1994. 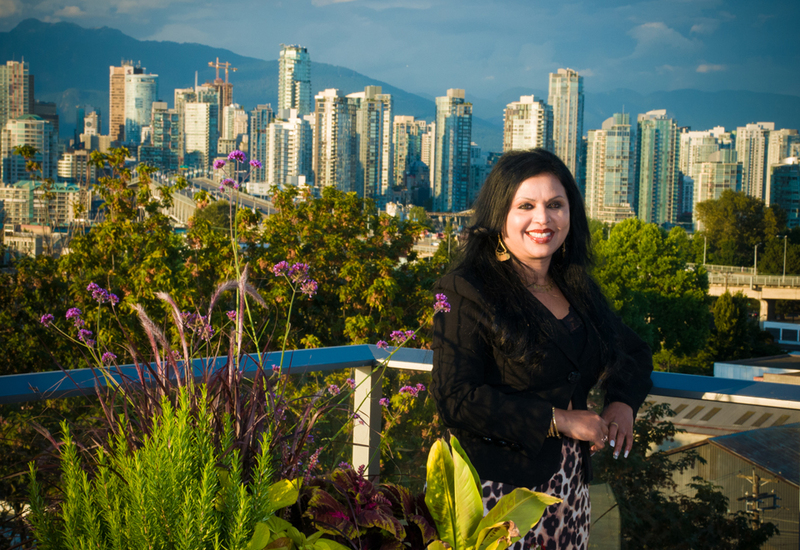 When Liz bought her home in North Vancouver, she made a strong enough impression on her real estate lawyer that he offered to hire her and train her as a notary public. She accepted, and the offer quickly expanded to join him in setting up the infrastructure for title insurance in B.C. Always keen to take initiative, Liz had set up a network of 350 lawyers across B.C. to work with the company, as well as a call centre that fielded 30,000 calls each month. Their client roster included more than 1,000 banks and credit unions. By 2008, exhausted from workdays that often began with east coast calls at 3am Vancouver time, Liz (along with Gordon) was ready to retire. She’d been involved with Don Bosco’s Children’s Home and Child Haven International, both not-for-profit organizations that raise funds and support for underprivileged children and women in developing countries. Her plan was to stop working, and travel to Tibet and India to intern for the organizations. But that wouldn’t begin until 2009. It was only September 2008. And Liz never sits idle for long—especially when there are initiatives that require her involvement and people in need of her help. Gordon sits on the Board of Directors for Quest Food Exchange. When it came to his attention that the organization needed an interim Executive Director, he asked Liz if she would step in. At first, she was wary of the amount of work it would entail. Looking at where the organization stood in 2008, she saw plenty of opportunity for expansion and improvement. Coming off an intense 17-year busy streak, where her stress level was constantly at “11 out of 10,” she was reluctant to dive back in. She tells the story of a woman she used to employ as her housekeeper during her days at FCT—“an amazingly bright woman who hadn’t finished high school, but I knew she had the potential to finish.” Liz hired her with the agreement that she would complete her high school courses. “But she was quite the handful!” says Liz. The woman routinely showed up several hours after she was meant to, always with an excuse (her cat ran away; she lost her keys; her car was blocked). Understandably, Liz—who dealt with extreme stress everyday on the job and wanted her home life to be more balanced—reached the end of her patience, and eventually told her housekeeper that she couldn’t keep her on. The woman burst into tears, and Liz had an immediate change of heart. But, as she is quick to point out, “you have to make time for things in life.” Things that matter. Liz started out as Quest’s interim Executive Director in October 2008, but it wasn’t long before they made the position permanent. 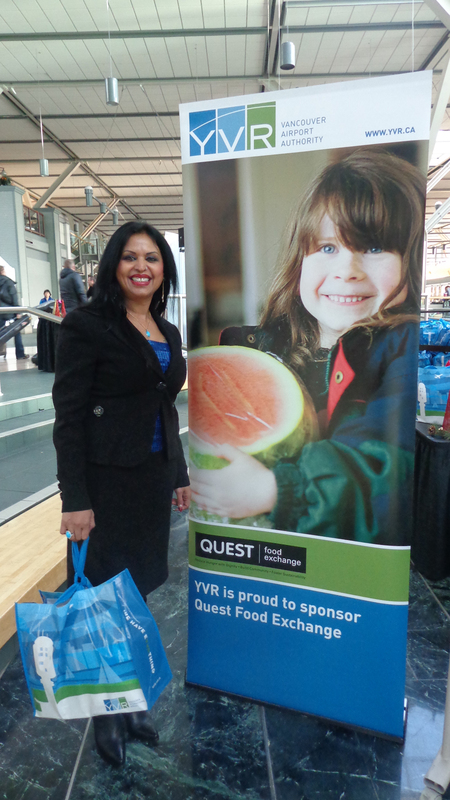 Since joining Quest, she has opened three not-for-profit grocery markets in the Vancouver and Burnaby area, and launched Quest’s own food distribution centre at 2020 Dundas Street. She has secured partnerships with a range of organizations to ensure the quality of the food, and direct ever-greater resources to the not-for-profit grocery markets and social service agencies—not to mention, away from landfills. 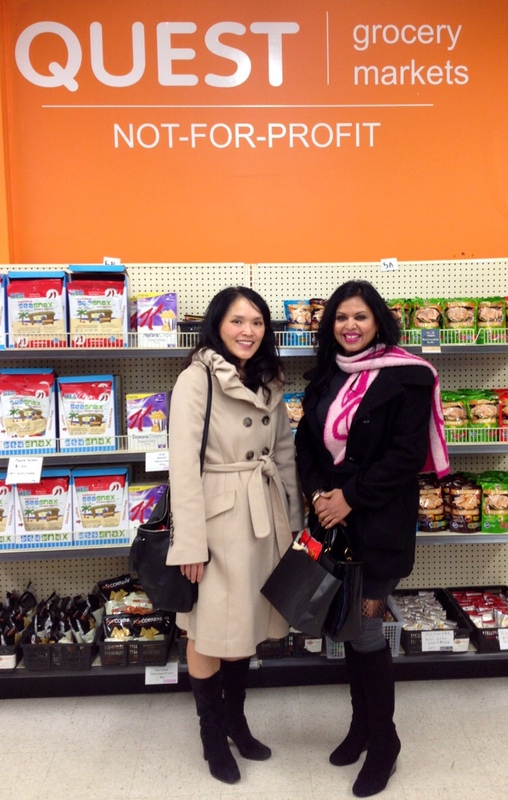 In 2014, Quest opened Canada’s first grocery store with braille signage and audible scanners. The idea came about when Liz began working with Eddy Morton, a Paralympian for walking, wrestling and judo who is deaf and blind. Realizing that many others, like Eddy, face added challenges in completing the basic daily tasks most of us take for granted, she wanted to create a grocery market that was accessible to people with disabilities. Eddy became an integral player in developing the proper signage for the market. Throughout that process, Liz discovered just how capable he already was. “I often think that we are the ones with the disability, not Eddy,” she says. She is deeply touched by the increased sense of independence Eddy says he has gained from the experience. He now makes his own way to the market each day, and does his job without an interpreter, texting staff with a special braille keypad. That potential for empowerment is what appeals most to Liz about Quest. She hopes to continue spreading that to all who shop at Quest’s markets and benefit from its supplies. Liz’s work, and Quest’s work, has garnered plenty of recognition over the years. 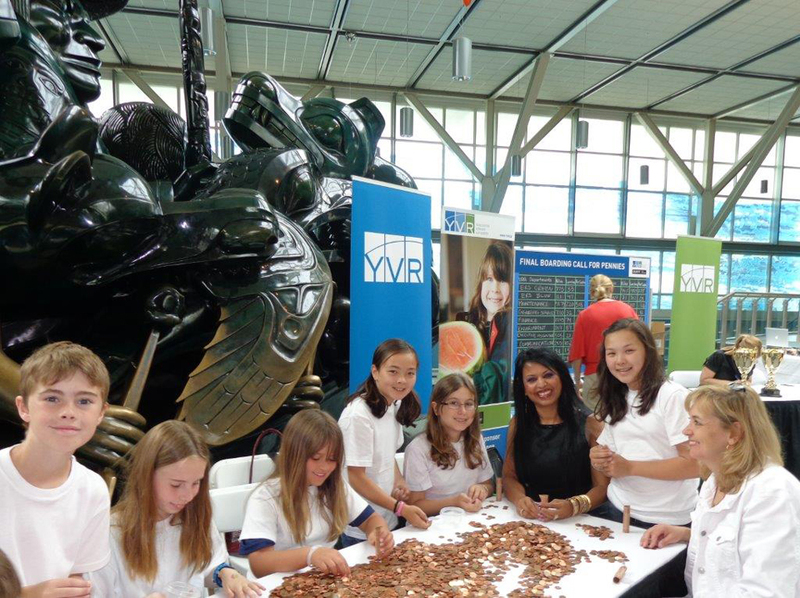 In 2014, she received the BC Food Processors Association’s (BCFPA) prestigious Leadership Award. She also recently accepted a nomination to join the International Women’s Leadership Association (IWLA). And earlier this year, Quest won the Canadian Association of Foodservice Professionals (CAFP) Vancouver Branch’s Leadership Award for Outstanding Contributions in Community Services and Leadership. Now, well into her “third adventurous phase,” Liz’s family life continues to thrive. She remains good friends with her former husband, and has a wonderful partner in Intergulf Development Group CEO Nabih A. Faris, who began helping her with Quest in 2010. She stays close to her siblings, who are spread out across Vancouver, as well as Toronto, Ontario, and India. And she’s very proud of her daughters: Melanie is setting up a counselling practice in West Vancouver, and Marella, who works with the West Vancouver School District as a special needs educational assistant, gave Liz her beloved first grandchild, Julian, in 2014. Liz continues to find ways of empowering others, even beyond her work with Quest. A huge fan of argan oil, she travelled to Morocco last year and discovered a women’s cooperative that produces the oil. When she returned home, she struck up a partnership with California-based Lucia Bay, helping them launch Argan Oil by Lucia Bay—on the following terms, of course: that they buy argan oil from the women’s cooperative in Morocco and donate a portion of the proceeds to Quest. In addition, she’s working with a team of doctors at Project Skin MD to bring argan oil to Canada. Their targetted launch date is autumn 2015. “It’s funny he said that, because all of (my parents’) time here in Vancouver, they would get up in the morning, go to church, visit other seniors who were in care homes, and be involved in other charity work they had left off in India,” says Liz. “So it surprised me that he still felt he hadn’t done enough. “And you know—” She pauses a moment to fight back tears. Liz may be too humble to recognize the depth of her warmth and kindness—how great her compassion is, or that she’s lived her whole life with generosity. But she is aware of three “basic philosophies” she follows in all things: respect the individual, honour your commitments and strive for excellence. “Those are the three that I live by,” she says. With that, let’s raise up in toasting Liz, who is doing more than honouring her parents’ legacy: She’s creating a new legacy all her own, one that thousands (and probably more) are benefiting from. To learn more about Quest Food Exchange, or to donate or get involved, please visit questoutreach.org. You can also follow @QuestExchange on Twitter and ‘Like’ the organization’s Facebook page. Thank you to Kickass Canadian Don R. Campbell for nominating Liz. Yup! Passionate and driven, definitely our Kickass Liz! Proud of you! You are wonderful person and you deserve the best. Thank you for sharing your story, the world is obviously a better place with you in it. I remember meeting your family at the Vedder River Campground when your sister and her husband had a seasonal spot there; the love you felt and respect you all had for each other was inspiring. So wonderful to see all these lovely comments about Liz! I’m very proud to feature her as an official Kickass Canadian. Her work, and Quest itself, is extraordinary and incredibly important. Congratulations, Liz! You’re truly an inspiration. Keep up the amazing work! Well done. We need more people like you, to be inspired by. Thanks so much for sharing this wonderful article. It so perfectly showcases your leadership, passion, empathy, kindness, courage and beauty. I am truly lucky to have met you… a mother and a mentor who continues to inspire those around you. Congratulations! Congrats, Liz! Not only is Quest feeding people, you are giving them the tools and resources to help them in their daily lives, giving them the confidence they need to face the everyday challenges. Keeping food out of the landfill impacts all of us! Very proud to support Quest Food Exchange! So proud of you Liz! Your drive and passion have been captured so well. Wishing you all the success you dream of! Liz, it’s been such a pleasure working with you through your years at Quest and seeing how much energy and growth you’ve brought to it. I’m always proud to be able to point out Quest as such a great example of what people can do to help others, using the resources and commitment of those around them. Congratulations on being recognized as a Kickass Canadian! Liz, you are one of the most dynamic and vibrant people I know! So happy that you are being recognized for who you are and for the work you do!! I’ve had the pleasure of meeting you in person a few times, and it was very interesting to read about your inspiring journey through life. Thank you for all the work you’ve done and continue to do. Congratulations Liz! This is amazing and you definitely deserve it. Well done! Wow, what an incredible 17 years! Marlene, thanks for the mention re. Liz’s cooking skills. 🙂 Not surprising, given how nurturing she is. 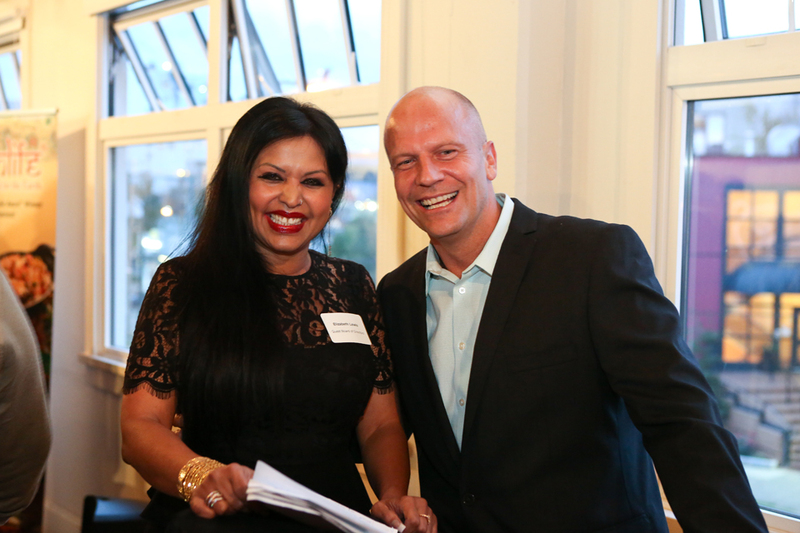 Liz has been an extraordinary leader of Quest and really taken the organization to the next level. Her positive and energetic personality make her a pleasure to be around and a fabulous role model. Definitely a Kickass Canadian! Congratulations, Liz. Your caring for others and sincere desire to give back to the community sets you apart from all others. The positive energy and the strong drive you project are a shining example for all of us. You make all of us proud and humble. We saw you start at KISR and were proud of you then, we have watched you grow from strength to strength and make a success of all that you set out to do. We could not be prouder, love and god bless. I’ve been blessed to know both the public and private Liz over the past 37 years – as a female entrepreneur breaking into the business world in the 1990s, as a global citizen with deep concern for issues related to poverty, food shortages and pollution, and last but certainly not least, as a mother with a nurturing, compassionate heart. It is all of these interwoven qualities that have lent to my mother’s dedication and immense success in the non-profit sector with Quest. Congratulations, mom – I’m extremely proud of your accomplishments, and know this award represents not only those spoken of today, but also the unspoken ones along the way. Liz, your passion towards Quest always inspires and drives me. Very proud of you. Hi Liz, I’m very proud of you for all of your achievements. Keep going and don’t stop! It’s empowering to see a fellow Indian woman being so successful. Thank you for everything that you have done for so many. So nice to see you recognized for all the great things you do, Liz! You are an inspiration.